There's no place like home The number of homes for sale is on the rise and mortgage rates remain near historic lows. That makes now a great time to say goodbye to your landlord. 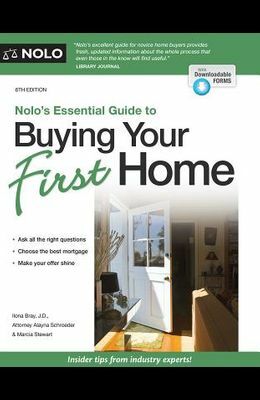 With Nolo's Essential Guide to Buying Your First Home , you'll not only find the right house for you, you'll have fun doing it. This book provides everything you need to: research the local market and listings decide between a house, condo, co-op, or townhouse create a realistic budget qualify for a loan you can truly afford borrow a down payment from friends or family protect yourself with inspections and insurance, and negotiate and close the deal successfully. You'll find insights from 15 real estate professionals--brokers, attorneys, mortgage specialists, a home inspector, a neighborhood researcher, and more. It's like having a team of experts by your side Plus, read real-life stories of over 20 first-time homebuyers. Download the Homebuyer's Toolkit Dozens of downloadable forms and podcasts that will help you find your dream home, crunch the numbers, interview real estate professionals, inspect the house thoroughly, and more--available on Nolo.com (details inside).